PLOT: A team of "dream extractors," (DiCaprio, Gordon-Levitt, Page, Hardy), those who steal ideas from people's minds for a living, are hired by an energy company mogul (Watanabe) to do the impossible - plant a destructive idea into the brain of his competitor. WHO'S IT FOR? This is an sci-fi actioner for attentive viewers – a lack of focus will be your enemy. And the moviegoers who ask questions every five minutes to the person sitting next to them, those evil people will be the true villains of the Inception experience. As for age demographics, this is one of those rare golden action movies that will best be enjoyed by mature thinkers. EXPECTATIONS: Though this is my most anticipated movie of the summer, I had abstained from seeing previews or trailers (with an exception of the first teaser), in case the advertisements were trying to bring in its audience with the wrong idea, and also so that most of the striking visuals would be completely fresh for me. BEST SCENE: There are many glorious elements within Inception. The first van roll sequence features the best moment in the film, as it is one of the most creative action sequences ever put to film. QUESTIONS: Is the usage of “Non, je ne regrette rien” a direct reference to Marion Cotillard’s performance of Edith Piaf in La Vie En Rose? If so, then there’s a whole bunch of trippy stuff about that ending that one could consider, but I don’t even want to discuss. My mind could very well just shut down. Also, isn't "Your mind is scene of the crime" a misleading tagline for a movie such as this? REWATCHABILITY: Absolutely. Even during a second viewing, the mind-explosiveness of the action is still very prominent – your heart will still skip a beat or two when that van flies off the bridge. As for the mental requirements, your mind is still very willing to re-enter into the puzzle of Inception. This is the sort of complicated movie that welcomes repeat viewings, not to necessarily make sense of something unclear, but because the viewer wants to contain as much of the movie’s ideas as possible. While a second viewing had me with more questions than the first viewing, I am sure a third viewing will even me out, and put me back into a state of unquestionable awe. Ever so the architect of his own spectacular action scripts, Christopher Nolan has constructed for his blessed audience a maze that we can never be happy enough to be caught in. But through the many mental zig-zags of the landscape of the brain-busy Inception, not only are we guided along with great respect from Nolan’s script (he explains everything to the right amount, in the best ways possible, and doesn’t abandon us to let us figure much of it out on our own), but our eyes feast about spectacular sights to blow our minds, while still trying to collect in our heads the movie’s many ideas. Within this seemingly complex film are beautiful and long sequences, which expand on a viewer’s creativity, but remain based in a stunning collection of logic. The ideas of Inception receive an extra layer of awesome when considering how feasible certain actions are, once using the arena of dream logic. Oddly enough, the weakest aspect of Nolan’s dreamy movie is his handling of typical shootouts. The guns used in these shootouts all sound too cappy, and the actual shooting seems to be completely understated. While his chase sequences are heart pumping (the beautiful reality of an action protagonist actually getting stuck in an alley way is very suspenseful), the gunplay is shockingly typical. This detracts from some of the effect of the third act of this movie, which partially stands as Nolan’s audition to direct a Bond movie some day. Nolan forgets the basics, and only in that instance, does it actually harm his picture’s goal towards perfection. 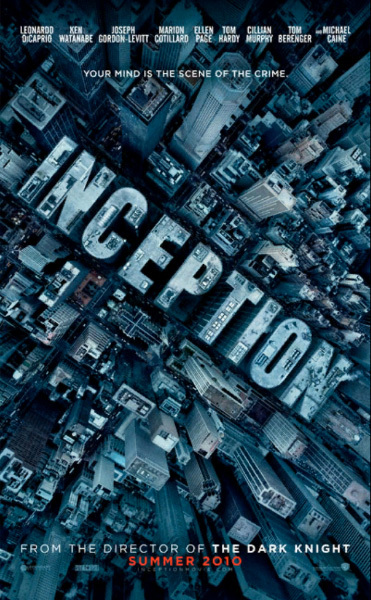 The rest of Inception stands as wholly original, without seceding to any action clichés, or even slight predictability. Inception very much functions like an action movie, but like the way that The Matrix made us rethink the creative potential of the genre, so does Nolan’s film. One could certainly argue that King Nolan has even more ingenuity running rampant here than in The Matrix, which has now been dethroned from the dignity of "Smartest. Action Movie. Ever."